Throughout the ages, royalty has worn sapphires as a symbol of wisdom, virtue and good fortune. Sapphires are also traditionally given as a gift on a fifth and forty-fifth wedding anniversary, and in America, the blue sapphire represents the birthstone for the month of September. All Sapphires are classified as the mineral species corundum, which forms in a hexagonal crystal system. Corundum is composed of aluminum and oxygen (Al2O3), and commonly forms in a shape similar to that of a hand grenade. The Mohs scale is used to classify the hardness or scratch-ability of an object, and objects are rated on a scale from 1 to 10. Corundum has a hardness of 9 on the Mohs scale and is second in hardness only to diamonds. A gemstone’s hardness is determined by how well a stone’s surface will resist scratching from the point or edge of another object. The Mohs scale essentially acknowledges that only a gemstone of a higher rating or equal Mohs number could make a scratch on its surface. Corundum forms in basically all colors, and all color varieties of the mineral species corundum are referred to as fancy sapphires, except for red, commonly known as ruby, and of course, the well-known blue sapphire. There is also the very rare asterism phenomenon in the chatoyancy (star ruby and star sapphire), identified by the star effect or cat’s eye effect seen in round dome-shaped cabochon gemstones. Almost all gems contain at least a few atoms of elements that aren’t in its normal chemical formula. The different colors in these gems are most importantly caused by the presence of those impurities. Sapphires that have very little impurities appear colorless. However, different levels of iron and titanium impurities cause the light blue and dark blue of sapphires. The dark blue in sapphires transpire when iron and titanium atoms replace just two or three out of every ten thousand aluminum atoms. When chromium replaces one out of every hundred aluminum atoms the red color that defines rubies becomes visible. The value of a blue sapphire and most gemstones is determined by its rarity and the supply and demand of the market. Gemstones, especially diamonds, are predominantly graded by what is known as the four C’s; clarity, carat weight, color and cut. Sapphires may appear opaque to transparent, and blue sapphires can appear a very light to very dark violetish-blue to greenish-blue color. The safest way for you to clean your sapphire is with warm soapy water. If possible, it is important to protect your sapphire by having it insured. The best way to maintain your sapphire, and any gemstone, especially if it is not insured, is by having it checked by a trusted jeweler to ensure that the prongs are properly covering and securing your gemstone and that your ring fits well. We all know how scary, frustrating and devastating it can be to lose something dear to our hearts, so please take the time to maintain, appreciate and enjoy your precious gemstones and jewelry. Nathan Swan is the owner of Bonny Eagle Jewelers, 111 Ossipee Trail E. in Standish. Questions? Email columnist@TheWindhamEagle.com. Monday night Windham Historical Society member Dave Tanguay presented a program on steamboats of Sebago featuring 200 slides to more than 60 people at the Windham Veteran’s Center. The two-hour presentation told of the history from the use of canal boats to the first steam run boats to the conversion to gasoline and the demise of that type of transportation because of the automobile. This time period, from 1791 to 1959 was also the heyday of postcards, so many of the slides were of postcards depicting what the vessels looked like. John Fitch created and patented the first steam driven vessel in 1791. In 1801, Robert Fulton created a steamboat for Napoleon and a steam driven submarine for him as well. One of the first boats on Sebago, a converted canal boat, was called the “Monkeydena” captained by Christopher Sampson. The steamboats on Sebago Lake were used to transport passengers to various resorts on the Raymond side of Sebago and on to Long Lake in Naples. Smaller boats, like “Lady of the Lake”, were used as sightseeing tours and cost around $.25 per trip. In 1869, after 20 years of little activity, Captain Thomas Symonds of Portland knew the railroad was coming to Standish, so he was ready with a steamboat to take passengers to their final destination. “The first few years had very few takers,” Tanguay said. Symonds sold out and the following year business picked up and was very profitable for the new owner. The time after the Civil War created “the great age of high living,” Tanguay said. “In 1871 it was the new age of conspicuous consumption.” People were traveling on trains and stagecoaches to get to Standish Landing to continue on to large resorts. There were more people traveling and more leisure time, he said. Many of the early boats sailed for a few years. Then during the winter when they were out of the water, they burned. The company that ran the steamboats changed hands many times, and often made changes to or built new boats. SD Warren Company bought Sebago Steamship Company and all the water rights on the Presumpscot River. “Warren liked to control things,” Tanguay said. The mill in Westbrook that used to be SD Warren still controls the water levels on the Presumpscot River. The “Goodridge” was built by Bath Iron Works in Portland was the biggest ship built. It burned in Oct. 1932. By the 1950s only the “Songo” was left. It made stops at Migis Lodge which was founded by the Goodridge family and to Thomas House in South Casco as well as other resorts and landings. There were a few gems of trivia and historical facts that made the presentation worthwhile. Commodore Stevens would blow a whistle when passing Frye’s Leap and Indians would appear and do a war dance for the captive audience. The actors were boys from the nearby boys’ camp, Tanguay said. The different types of bridges that were in place in Naples and just before the locks varied, including the swing bridge that used to be in Naples and is still being used just before the locks in Sebago. There were also postcards showing the casino in Naples on the causeway that is now Rick’s Café. The most interesting part of the program was knowing where the places Tanguay spoke about were, from the Standish landing, where the train tracks still protrude from the tar, to the Songo Locks, where one can spend hours watching the boats on a summer’s day. People in the audience knew the bends in the seven to nine miles long Songo River, which only covers two miles as the crow flies and some were old enough to have ridden on some of the boats. One man, 94-year-old Arthur Richardson, rode on the Goodridge and was born at Songo Locks. He added relevancy to the presentation, so that the audience knew that it was history, but not ancient history. In the 1960s and 1970s, mail and passenger service was still done by water in a converted lobster boat. In the 1960s the Songo River Queen I was put on Long Lake. It was configured many times before it was traded in for the Songo River Queen II that is still on Long Lake. More information can found on this topic in local books. The historical society is also focusing on the 2.53 acres they bought to create a village green. It will take $400,000 to make the dream a reality, but they hope that through programs like this one and through raffles, this year it’s a hooked rug that they are selling tickets for, that they will be able to raise enough money to move all of the scattered historical buildings in Windham to this central location just off Windham Center Road near their current building. Photo: Presenter Dave Tanguay stands with 94-year-old Arthur Richardson who rode on one of the Sebago steamboats in the 1920s and 1930s. 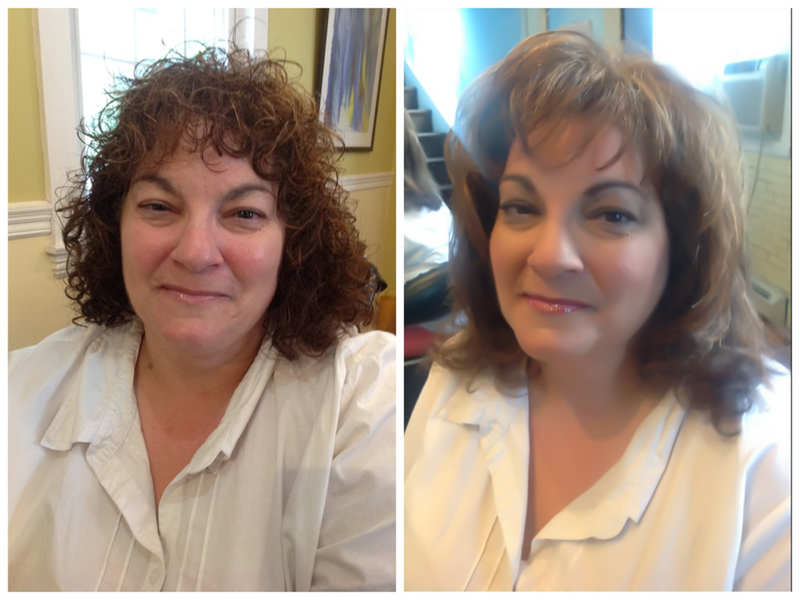 Ellen Stanley just celebrated a birthday, and with her youngest child a senior at Windham High School, she needed a makeover. “It was my birthday day on Sunday. It was a really nice present. It made me feel better. I didn’t feel quite so old,” Stanley said. 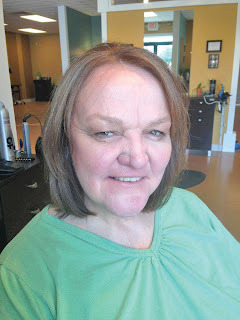 Chic Boutique stylist Rachel MacDonald started by doing a nice natural golden brown color to add richness to her look. She then freshened up her haircut by taking a bit of length adding some framing around her face and blowing it out smooth. She completed the look with a light makeup application. 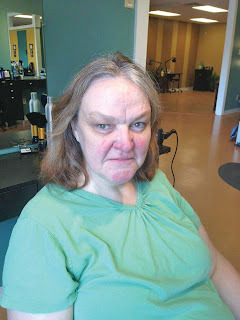 The makeover was a chance for Stanley to do something different and to get rid of her gray hair. Everyone she saw told her they liked her new style, especially the color. Stanley also was happy that MacDonald gave her lots of styling tips, telling her how to work with her new haircut. Mac Donald also gave Stanley make up tips, and since Stanley doesn’t usually wear make up, putting a minimal amount on was a good call. “I didn’t look like a Jordan Marsh model that had just walked through with make up caked all over her face,” Stanley said. Stanley was also offered the opportunity to have her teeth whitened at Dr. Leslie A. Elston’s dental office. 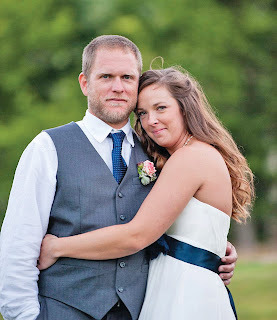 Congratulations to one of our amazing graphic designers, Julia, who got married August 10 at Sunday River in Newry, Maine. Her new husband, Jamie Donaldson and she took a mini-honeymoon to the White Mountains before returning home to Windham. Being prepared for back to school takes a little effort, but the dividends will last all year. 1. Start putting the whole family on the school schedule of going to bed early and getting up early. Set bedtime a half-an-hour earlier each night. 2. Review all the school materials your child got at step-up day. Make sure they have the supplies they need at hopefully they did the assignments given over the summer. 3. If your child’s school allows it, take them to the building to try their lockers and get familiar where key classrooms are, as well as the bathroom and front office. 4. Make some decisions before school starts. Will you drive your child to school? Will they eat hot lunch or bring a lunch? Discussing issues like this will help the child be mentally prepared. 5. Create a homework space and set guidelines about homework and screen time. Homework is important for reinforcing concepts and introducing new material. 6. Have play dates before school starts with some of the children that will be in your child’s class. Having familiar faces and shared experiences makes day one not as scary. 7. Talk to your child and see what his/her anxieties are, if any, about starting school. Let them know you’re there for them no matter what. With a flying leap, Misty landed in Taylor's lap. Her little tongue hung out, furiously panting and shivering. Taylor held her tightly. "It's okay. It's okay." She repeated the words trying to soothe her poor little dog. In reality, she was trying to calm her own concerns, without much success. A gust of wind whistled around the corner of the camp. Taylor stroked Misty. When she heard the crackle of breaking glass, her stomach dropped. Clearly it was more than a rain storm. It felt more like a tropical storm. Holding Misty on one arm, Taylor tucked her dog close and hurried through the camp inspecting each room for damage. Nothing. Hopefully, it was one of the shed windows. Setting Misty down, Taylor hustled to the back door and yanked it open, prepared to check around outside. Misty dashed out into the wind and rain. Apparently, in her misguided doggy brain, being outside in the pouring rain seemed a better idea than being warm and dry inside. "No!" Taylor hurtled through the door, heedless of the pouring rain. "Misty. Come." She caught sight of the panicked dog heading into the underbrush. Heart pounding, adrenaline clogging her blood, Taylor chased after Misty. The wind propelled her forward as she scrambled through the bushes, calling her dog's name. Shouldering aside soaked branches, the wind blew her into the Jennings' yard. "Taylor? Get in here. What in the world are you doing?" Looking up, she saw Brad standing in his doorway. She must have been shouting louder than she realized. "It's Misty." "My little Yorkie. She's escaped. She hates storms." When Taylor saw his daughter in the doorway, she pushed aside her concern for Misty. "No. Faith should wait inside." Brad knew Taylor was upset. Besides the rain drops running down her face, she looked as if she were crying. They had to help her. He shook his head. "Faith might get scared waiting on her own. Besides she loves dogs." He stepped back into the living room. "Let's help Taylor." Faith looked up. "Help her how, Papa?" "Her little dog, Misty, escaped." "Probably got scared by the storm." He held out her jacket, and she slid in her arms. "Of course not. You're a big girl." While he slipped on his jacket, he heard Taylor continue calling. "Misty. Misty." Outdoors, the rain pelted down, remnants of the off-shore hurricane. "Maybe you'd rather wait inside, sweet pea." "No, Papa. This is an adventure. And I can help." Brad grinned, pleased his little girl was so feisty. They caught up with Taylor and walked along the side of his camp. The wind gusted and then it was quiet for a minute. Faith tugged on his sleeve. "What's that? I hear something." They stopped and stood quietly. He heard a small whine. Squatting down, he peered under the deck and glimpsed a small tan and black pile of fur cowering in the corner. He beckoned to Taylor. She crouched beside him. The rain had plastered her long, dark hair against her head, releasing the flowery scent of her shampoo. "Misty." She called again. "Misty. Come." He turned to Taylor. "Is there something she likes to eat? People food." Grey-blue eyes wide, she stared at him. "Cheese." She shivered. He rested a hand on her shoulder, offering comfort. "Sweet pea. Can you run inside and grab some cheese? But go quietly across the deck so we don't scare Misty even more." "Yes, Papa." Faith tiptoed across the deck and opened the sliding door into the living room. Rain continued to pound on the deck and the wind lashed the trees. Faith raced back inside, returning with an unopened block of cheese clutched in her hands. He broke off a bite-sized piece. "Now, I want you to be really brave." "I am." She squared her shoulders. "I know. Can you crawl under the deck--like you do sometimes. Taylor and I won't fit. When you're close to Misty, hold out this piece of cheese so she can smell it. Then slowly back out. Say her name softly, tell her to come, so she follows you." "Okay." "Faith touched Taylor's hand. "I'll save Misty for you." A slight smile lifted Taylor's worried expression. "That would be awesome." Brad's heart swelled at his daughter's bravery and thoughtful words. So different from her mother. Amy Hanrahan was feeling blah about her look and with a quick email from The Windham Eagle, she was whisked off to Voila Salon and Day Spa for an revamp of her hair style. “They were so sweet. They were attentive and kind. They wanted me to be pleased,” she said. “It was that time of the year and I couldn’t stand to look at myself. I walked out of there and I felt like a million bucks,” she said. “Maybe I’m not as bad as I think I am,” she added. 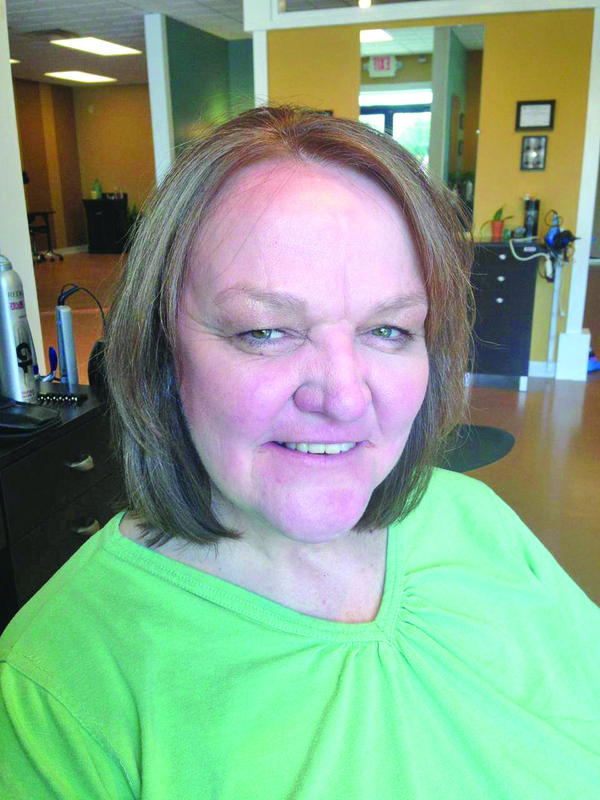 Hanrahan’s stylist Melissa McGuire “softened the color with some highlights and shaped Amy’s hair, but kept most of the length so when she wears it curly it wouldn't be too short for her. McGuire thought it was important for Amy to keep her hair longer because Amy felt better with it longer. Sometimes it's good to go more gradual with a change then to do it all in one visit. The art of listening to a client is sometimes as good as getting the right style,” said Voila owner Tracey Chambers. Hanrahan also had a light application of makeup from Voila’s special products. “People were really impressed by the after,” Hanrahan said. Her first stop after the makeover was to her parent’s house, where her father is not a fan of straightened hair. “He liked it. That was saying something,” Hanrahan said. She is looking forward to school starting and going back to her job as the secretary for the Manchester School. She is interested to see what her co-workers and students have to say. “It really was a gift,” she said. Hanrahan was also offered the opportunity to have her teeth whitened by Dr. Leslie A. Elston.